Paradise Regained - Weigl's Fifth "Apocalyptic"
In performance, the effect will be even more striking. This work begins with the filing of orchestral musicians into the concert hall, warming up their instruments like normal. This isn't a transcribed preamble to a concert like Edgard Varèse's Tuning Up (1947) but genuine, if highly predictable, span of "chance" music. As the buzz of non-music suffuses the hall, the conductor takes the stage and instructs a quartet of low brass players, positioned oddly on a raised platform, to sound a theme. Their sharply-etched annunciation stands in starkest relief against the disorderly backdrop. The brass quorum call thus issued, the warming up musicians fall in line, proposing a handful of mysterious motifs that will soon coalesce into this symphony's main thematic subject. This is the beginning of Karl Weigl's Fifth Symphony "The Apocalyptic" (1945), from a movement dubbed "Evocation." It's a rhetorically direct strategy, to wring order out of a swarming musical chaos, routine since Beethoven's 9th first premiered in 1824. The outlines of the brass melody are also familiar, the downward agglomeration of perfect intervals resembling Beethoven and perhaps even more, the grand columns that buttress Anton Bruckner's symphonies. In the long competition of composers striving to out-inchoate each other's openings, Weigl's is the logical extreme; to my knowledge, no such an audacious version of the ex nihlo archetype had been attempted prior to this 1945 work. It is the more surprising because Weigl was no avant-garde composer, and this is no experimental symphony. Nothing remotely as strange occurs for the duration of the long (50 minute) symphony. For all its potency in establishing the mood of this work, the opening of the "Apocalyptic" is a weirdly one-off event. In full Brucknerian fashion, there's a false climax at the end of (what seems to be) the development section, evoking the life out of that introductory brass theme. This is not music that minces its words. Karl Weigl is not a household name for the same reasons that Zemlinsky, Schreker, von Schillings, and Schmidt are not. While an inventive and prolific composer, his music continued up the late-romantic branch of Mahler and Strauss long after the history-hogging offshoot of atonality had broken off. Born into an assimilated Jewish family in Vienna 1881, Weigl was situated at the absolute center of Viennese musical culture for several decades. He studied with the luminaries Fuchs, Adler, and Zemlinsky, participating with the latter in his progressive "Society of Creative Musicians" along with Schoenberg and Webern -- pals until their musical paths diverged so radically. He went on to become Mahler's right hand man at the Vienna opera, acting as vocal coach and rehearsal conductor. Weigl garnered prestigious positions and critical praise for his music through the 20s. But the rise of the Nazi party dragged this prominent composer's reputation down considerably. With Hitler's annexation of Austria, the Jewish socialist managed to emigrate to the United States like so many other German composers. Adjustment to American life was difficult, but he eventually secured teaching posts at various schools of music on the East Coast. But deprived of the renown as a composer he enjoyed in Europe, he was forced to retreat into composition without performance. Weigl wrote his Fifth Symphony at the conclusion of World War II. It is dedicated to "the people of the United Nations" and bears the inscription "to the memory of Franklin Delano Roosevelt" -- a gesture identical to that of Erich Wolfgang Korngold (a former student) in his dedication to the F-sharp Symphony (1952). The timing and appellation "Apocalyptic" suggests that this is a war work; Weigl, an ardent pacifist, conceived of his Second Symphony as a response to the Great War. But there is little external evidence indicating what exactly Weigl meant in programmatic terms. 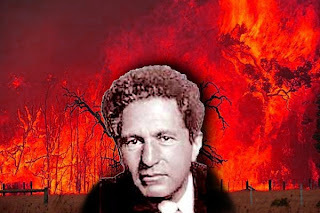 I suspect he was making a nod towards Bruckner's Eighth Symphony, sometimes also referred to as "Apocalyptic," for the spirit of Bruckner infuses much of this work, particularly the massive 3rd Movement Adagio "Paradise Lost." Unquestionably the heart of the symphony, it is its most bald-faced musical anachronism, gorgeous but seemingly immobilized under the 19th century symphonist's shadow. Here is a sample of the only slightly updated Brucknerisms, swelling climaxes and all. Paradise for Weigl, it would seem, is a Bruckner slow movement in double variation form. (When it comes to direct references, which are numerous, I hear more of Bruckner's 7th "Lyric" symphony than the 8th). Against the dominance of Viennese atonality that Weigl could never accept, the power of such sweet tonality was indeed "lost." The "Apocalyptic's" second and fourth movements are most literally eschatological. The second, titled "The Dance around the Golden Calf," is a sardonic, very Mahlerian scherzo with certain modal touches that Llyod Moore (author of the one recording's liner notes) hears as distinctly "Jewish." (So who exactly is the target of sardonic energy here?). The fourth movement, "The Four Horsemen," is eventful but not necessarily the fire-and-brimstone you'd expect from the title. Rather, elements of previous movements (particularly "Paradise") clash against the backdrop of a semi-serious march themes. You'll be hard pressed to locate Famine, War, Death, or Pestilence individually here, or even a clear-cut sense of victory or defeat. The ending, a sudden blast of celebratory bells, sounds perfunctory and pessimistic. All of this is quite a contrast to the work's unearthly opening sounds. It is a gesture which, for all the symphony's beauty and teeth-gnashing, Weigl never feels the need to corroborate. Weigl never survived to hear the eventual premiere of this work at the hands of Leopold Stokowski in 1968, although it was highly praised when finally heard. I freely admit I only picked up the BIS recording of this work because of the extravagant cover art. Thomas Sanderling's conducting of the Rundfunk-Sinfonieorchester Berlin is stellar, especially for such a red giant of a work, but without other recordings, I am in no position to say if it's truly definitive. Only one other Karl Weigl symphony has been recorded, the Sixth, by the same forces. thank you: interesting notes about a neglected composer and his music. A lively and lovely introduction to a remarkable symphonic masterwork. Thank you so much for sharing your insights with strangers.